A novel in verse. Raised in South Carolina and New York, Woodson always felt halfway home in each place. In vivid poems, she shares what it was like to grow up as an African American in the 1960s and 1970s, living with the remnants of Jim Crow and her growing awareness of the Civil Rights movement. Touching and powerful, each poem is both accessible and emotionally charged, each line a glimpse into a child’s soul as she searches for her place in the world. Woodson’s eloquent poetry also reflects the joy of finding her voice through writing stories, despite the fact that she struggled with reading as a child. Her love of stories inspired her and stayed with her, creating the first sparks of the gifted writer she was to become. I am not a fan of poetry. I hated it as an English lit major. I avoided it as much a possible as an English teacher. But, this book of verse by Jacqueline Woodson is so beautiful and so vivid that I could possibly be a convert. 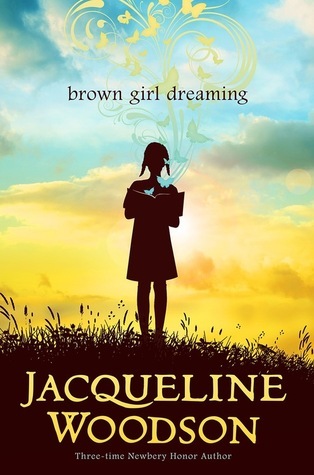 Brown Girl Dreaming is a reminder of why representation in our books and entertainment is so important. More than a decade separates our childhoods and yet so many of her experiences resonate with me. To have had this book or one like it when I was growing up… who knows what it might have inspired in me, to see someone’s life so similar to my own. From summer days at my own Grandmother’s house, to those Saturday afternoons getting my hair straightened, to being called in once the streetlights came on like in “Game Over.” I got a good laugh over the, “Your mama’s mean!” line. I can’t tell you how many times I heard that growing up when a game of hide and seek, kick ball, or freeze tag had to be cut short. Maybe I wouldn’t have disliked poetry so much had it been as relatable as this. Imagine what the words of an National Book Award winning author can do for a child who also struggles with reading like little Jackie Woodson did. So many of the poems in Brown Girl Dreaming stood out to me; I was starting to dog-ear every other page. Like “Day Work” because it reminded me of my grandma, cleaning other people’s houses so my mother and aunts and uncle and eventually their children could have something better. for what and who it will get in return. And “Stevie and Me,” which highlights how seeing brown people in books is so, so important and influential to little brown boys and girls. Again, representation matters. This book of poems matters. It deserves a spot right up there with I Know Why The Caged Bird Sings and any of Langston Hughes’s works. Though its marketed for middle grades, people of all ages will appreciate Woodson’s gift for storytelling. There is something in her words and her experiences that anyone can connect with.